We still have some LXY801A receiving cards in stock!!! Please send us pictures of both back and front sides of your LXY801A card once you have placed the order with us. We will need to do some configuration before shipping. 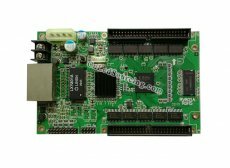 LXY801A 0834 from the LINSN RV801 series had been a great receiving board for full color LED display screen for many years. Now it is out of stock and no more in production any more at LINSN company. You can buy its upgraded models---RV901H or RV901T. But we don't guarantee that either of them can work with your old cards.